Tomatoes are loved, especially by people who like to eat healthily. They are rich in nutrients that are essential to our body, and they are easy to digest as well. Not only are tomatoes nutritious, but they are also quite juicy, tasty, and simply mouth-watering. This is especially true for tomatoes that are fresh from harvest. Introducing the beefsteak tomato plant! In this post, we will tackle another tomato variety that has the perfect combination between juiciness and healthiness. Read on as we discuss relevant details and all you need to know about beefsteak tomatoes and their plants. 1 What is a beefsteak tomato? What is a beefsteak tomato? Beefsteak tomatoes are a type of tomatoes characterized by their remarkably large fruits. Not only are they humungous, but they are also heavy. Some specific varieties of beefsteak tomatoes can bear fruits weighing around 3 pounds. Because of their size, beefsteak tomato fruits are quite juicy inside. Each piece of tomato fruit of this variety can contain tremendous amounts of nutrients. Beefsteak tomatoes are not limited to just one variety of tomatoes. In fact, a large number of tomato varieties are categorized as beefsteak tomatoes. The size aside, these beefsteak varieties can vary to a large degree. For example, they can have vastly different colors. They can be red, green, orange, yellow, white, and even black. You should not be prejudiced against their taste either. Beefsteak tomatoes are not just huge blobs of sour stuff. Although some of the beefsteak tomato varieties are, indeed, similar to your typical red tomato, a large number of them actually are not. Some of them are mildly sweet, while some are straight-up sugary. These tomatoes are the real deal in terms of flavor. Another thing to note about beefsteak tomatoes is their plants. To support the beefsteak tomatoes’ large fruits, their plants can also naturally be huge and tall. Most beefsteak tomatoes are classified as ‘indeterminate’ and can grow to an astonishing 12 feet of height. Furthermore, beefsteak tomato plants can take a very long time to mature. Depending on the soil, sunlight, and many other factors, this maturity period can even take longer. There are numerous varieties of tomatoes available in the market. In fact, there are so many that it is actually impossible to accurately count them all. Varieties categorized as beefsteak tomatoes are only a part of this number. So why should you grow beefsteak tomatoes over other tomato types? Here is a list of a few reasons why you should plant beefsteak tomatoes. Without a doubt, people love their sandwiches. To these sandwiches, beefsteak tomatoes are simply the perfect addition to complete the BLT (bacon, lettuce, and tomatoes). In fact, beefsteak tomatoes are great for hamburgers too. The reason for this is mainly due to their fruit size. Generally speaking, for your sandwiches and burgers, you definitely would want to put one tomato slice only. Due to this, a tomato slice large enough to fit well with whole buns is definitely necessary. Beefsteak tomatoes just happen to fulfill their requirement. When sliced, each of the slices is just the right size to go along with the bread and the rest of the ingredients in a sandwich. One advantage that beefsteak tomatoes have is definitely their fruit size. What you may not know, however, is that this indirectly contributes in helping against cracking. In smaller varieties of tomatoes, fruits are generally formed in a cluster. Not only that, but they can also be surrounded by dense foliage. Because of how small their fruits are, if you are careless, you may miss some fruits that are somewhat well-hidden. What happens when you miss ripened fruits and do not harvest them? Obviously, they are wasted. But moreover, eventually, they will crack. Once they crack, harmful insects and other organisms can enter them. Consequently, the plant is suddenly in a dangerous condition. Beefsteak tomatoes do not have this problem. Unless you have some special circumstances, you should be able to harvest every single beefsteak tomato fruit that appears, since they are easy to locate. Admit it. Whenever we achieve something, we like to brag about it, even for just a little bit. Therefore, once our tomato plants’ fruits fully mature, it is only natural that we would want to show it to our parents, kids, family, friends, or neighbors. In this scenario, nothing is more satisfying than having beefsteak tomatoes. Imagine showing your friends your fully-grown 3-pound tomato fruits. You are sure to see some amazed faces among them. Beefsteak tomatoes are simply majestic. People who are not familiar with the different varieties of tomatoes can only marvel at their sight. Although beefsteak tomatoes have some of the best varieties of tomatoes that currently exist, they do have a catch. It is in the fact that growing them may be quite challenging. Here are some things that you should be prepared for when you plan to grow beefsteak tomato plants. Beefsteak tomatoes generally need a long time to fully mature from a seedling. This process can even take more than ninety days. Ninety days of growth period means ninety days of exposure to diseases and other troubles. Because of how long the entire process can last, the chances of something going wrong are naturally increased. Even if you manage to care properly for your beefsteak tomato plant, there is still a chance that your yields will be low. Various factors like soil composition, sunlight, water intake, and nutrition can affect your harvest. Sweating for three months just for a pitifully low harvest can be disheartening. To avoid this, you should properly and regularly water the plants. Constant application of fertilizers is highly recommended as well to make sure your beefsteak tomato plant is getting the right amount of nutrition. Because of how large the plants of beefsteak tomatoes can become, sufficient caging and staking is necessary. You can use strings, sticks, poles, or wires to form your plant cage. Your main goal is to support the beefsteak tomato plant so it grows properly and in an upwards direction. Their vines should not touch the ground, and thus, needs to be perfectly managed. As mentioned earlier, a sufficient amount of water and fertilizers may be necessary to support their healthy growth. Although beefsteak tomatoes may be quite a challenge to grow, the achievement of being able to successfully do so is such an amazing experience. If you are up for it, you may want to start planting beefsteak tomato seeds immediately. To make growing these tomatoes easier, it is best to be guided accordingly. In particular, you should find the best beefsteak tomato seeds available in the market. This section lists a few of the beefsteak tomato seeds that you should really consider. The first tomato variety in our list is the Big Mama tomato. 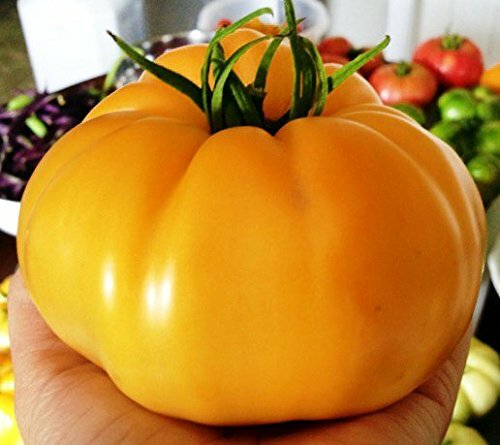 Even among beefsteak tomatoes, the Big Mama variety is pretty unique. This is because it can be classified as either a plum tomato or a beefsteak tomato. In terms of the height of its plants and the size of its fruits, the Big Mama tomato can be considered as of a beefsteak variety. On the other hand, the fruit’s shape and texture resemble that of a plum tomato variety. It simply has the best of both worlds between the two categories. 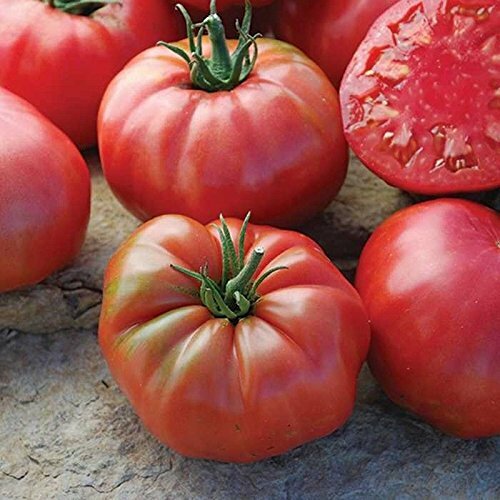 The Big Mama tomato fruit has a thin but firm exterior that contains great flavor within. Combined with its size, every single fruit is filled to the brim with juice and nutrients. Big Mama Tomatoes are hybrid indeterminate plants. They grow to maturity in around 80 days. They bear large red tomatoes that are great for salads, sandwiches, and even as canned products. 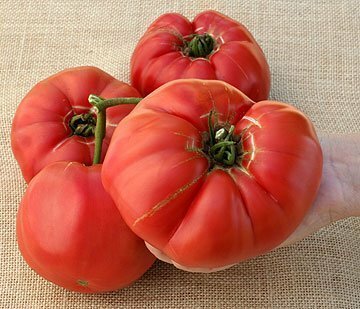 It is simply impossible to write about beefsteak tomato varieties without including the large Italian tomato variety. Italian tomatoes, as you may already know, are humungous. Their fruits can grow to more than a pound with a diameter of 4 inches. Despite being beefsteak tomatoes, Italian tomatoes are actually easier to grow than some other varieties. If you are only starting to get interested in planting tomatoes, Italian tomato seeds are an excellent choice. The best advantage of Italian tomatoes is the fact that they are heirloom/heritage tomatoes. Recently, heirloom tomatoes have been getting more and more popularity among gardeners. These tomatoes are as natural as possible. You can even plant the seeds that you obtain from them. Kentucky Orange tomato seeds are a must-have when you want to plant beefsteak tomatoes. This is especially true for Americans because this variety is considered local in the US. Therefore, they are proven to be able to survive without any problems there. 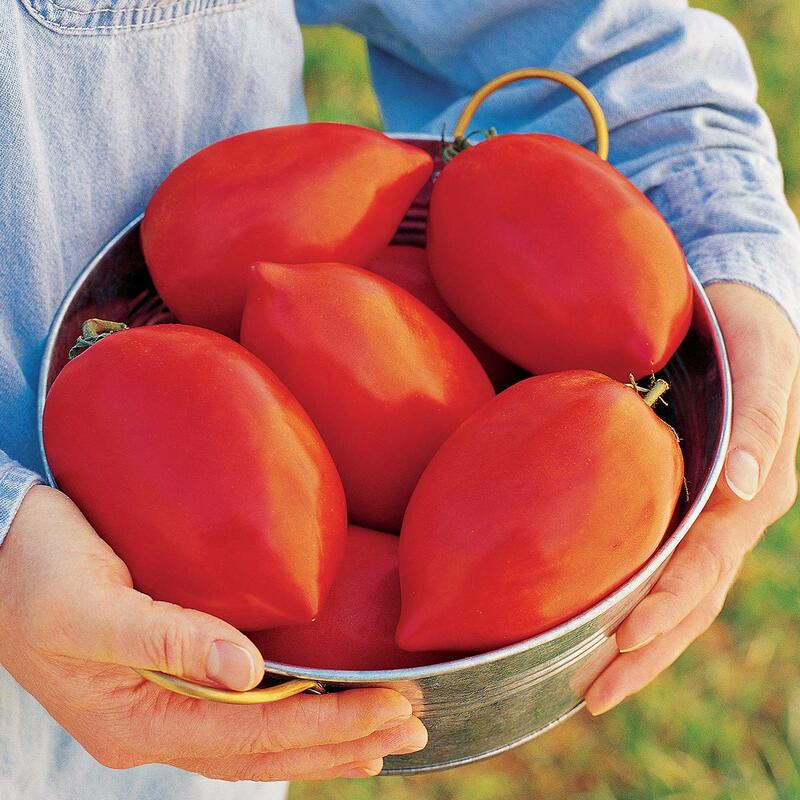 Although Italian tomato fruits can grow huge, fruits from Kentucky Orange tomato seeds will not lose either. Most of them can reach more than one pound. In fact, it is not uncommon to see these fruits reach more than 2 pounds to almost 3. As expected of its color, the Kentucky Orange tomato fruits are sweeter than their red variety counterpart. Not only that, but their acidity is also lower despite being bigger. 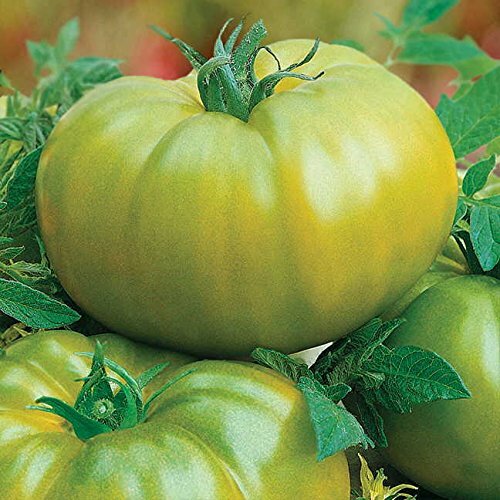 If you are not satisfied with the beefsteak tomato seed varieties that were listed so far, perhaps the German Queen tomatoes may intrigue you. The fruits of the German Queen Tomato plant are sweet. Although they are not quite orange in color, they do have lighter colored streaks in their bodies. Like the Kentucky Orange, this variety also has low acidity levels. They are not quite as large the Kentucky Orange, but they are still huge nonetheless. Their weight average is around 1 pound per fruit. The German Queen Tomatoes are also heirloom tomatoes. This is an advantage since heirloom tomatoes can be more forgiving and their seeds can be planted again. The Green Tomato from Park Seed is quite a unique tomato variety. For starters, they have green hybrid fruits. Well, they are not exactly green, but more like a mixture of gold or yellow and green colors. Although green tomato varieties are less common than other tomato varieties, they are not exactly rare. You may be skeptical about growing and eating green tomatoes, but Park Seed Green tomatoes are actually quite delicious. They do not have the same low acidity levels compared to the German Queen and Kentucky Orange varieties, but they are similar in that they are sweet. These green tomatoes are indeterminate plants. Fortunately, they can grow slightly faster than other beefsteak tomato varieties. If you plan on showing the tomatoes you have grown to your family or friends, planting the Park Seed Green Tomatoes may be an excellent choice. As if the visual impact of large tomatoes is not enough, you also add the uncommon green color on top of that. They will surely be even more amazed. Other tomato varieties like the cherry tomatoes and paste tomatoes are also excellent tomato choices. However, they cannot quite compare with the majestic presence of beefsteak tomatoes. As you have already known, beefsteak tomato fruits are gigantic and will surely be fulfilling to anybody. If you plan on planting tomatoes, you may want to consider beefsteak tomatoes for they are quite worth it.